When was the last time your PM sat down with your BD? And no, I don’t mean when your PM explained the product so your BD could find the right channels to sell it through. I mean, really sat down to work together, open up and collaborate on everything. If this is not happening regularly, you are missing out on some big opportunities. In our complex world, swamped with tools and highly specialized services, it is very challenging to provide a comprehensive service end-to-end all by yourself. Product managers often use existing tools and services instead of developing in-house. BD managers often partner with existing channels instead of building a sale organization. But what if they could take a unified look at the market. Shoot for the moon and come up with the most holistic solution for the market you operate in. Something that is not limited by what the product can reasonably grow into or by our partners’ reasonable reach. The vision can be much broader. You could offer an innovative holistic solution, some of which is built in house and some completed by partnering. PM’s are often encouraged to ‘get out of the building’ and talk to customers and prospects to learn about their needs. BD’s often meet with potential partners and learn about their offerings. They both work hard to get to the root motivation, often using similar methodologies for listening (e.g. ask ‘ why’ 5 times). They share the need to be on top of what the competition is doing. Both need a delicate ear for identifying opportunities for adding value and differentiating. And at times they may even find themselves interviewing the same person who started as partner and evolved to customer (or vice versa). Encourage them to share notes, impressions, possibly even get out of the building together! If you take a moment to think about it, product Wireframes and business Letters of Intent (LOIs) or Term Sheets, play the same role. Both are high level representation of an abstract idea. Drafted in a high level and simple ‘language’ that is loose enough to not complicate things (legally or technically), yet clear enough to state a concrete intention or plan. Both are used early in the process in order to get other stakeholders to react. Having drafted both on different occasions I can say the challenge of how specific vs. how high level, is the same. Your PMs and BDs can help each other find that balance. Where the key point that matters is well articulated or designed, but at the same time, leaving enough ‘contribution space’ for the recipient to earn a sense of ownership. The hardest and often loneliest job your PMs have is to MVP things. Deciding what features to remove from v1.0, while maintaining enough to test key product assumptions. Surprisingly, your BD team has similar challenges. Most partnerships start with a simple ‘date’, a single joint trial project, or pilot customer. Choosing and designing the right pilot, one that has ‘quick-win’ potential, is not easy. It is actually very similar to deciding on an MVP version. So, even though PM aren’t BD experts, and vice versa, and maybe because of that, they can offer un-biased advice to each other. Ask the hard questions: ‘what if you did x without doing y?’. Introduce a fresh look on a similar challenge. Who makes product road-map decisions? Who decides which partnership to go ahead with? Almost everyone has an opinion on both, and just as many voice it… but both decision processes need to be limited in terms of decision makers. Both need to have a process in place to scope ideas and let everyone voice their 2-cents. But both also need to have a strict process in place for how decisions are made, for how KPI’s are defined and for when a feature / partner is terminated. And you’d be surprised at just how similar these processes are. Reflective of the company’s culture and managerial style much more than the domain for which they apply: PM or BD. I recently read a nice piece about the PM passions. As someone who started in BD and moved on to PM, I couldn’t help see the resemblance to BD passions. With minor wording adjustments: technical=legal, user=partner experience, user=partner psychology, data (analytics=financial), project management and wackiness=creativity. So, if you (or your HR) are using these tools to evaluate PMs, why not extend similar principals to interviewing BD? And while you’re at it, if PM and BD share the same passions, wouldn’t you think they’d work well together? After all they both seek to balance the company’s playbook with a creative flair that makes them unique. 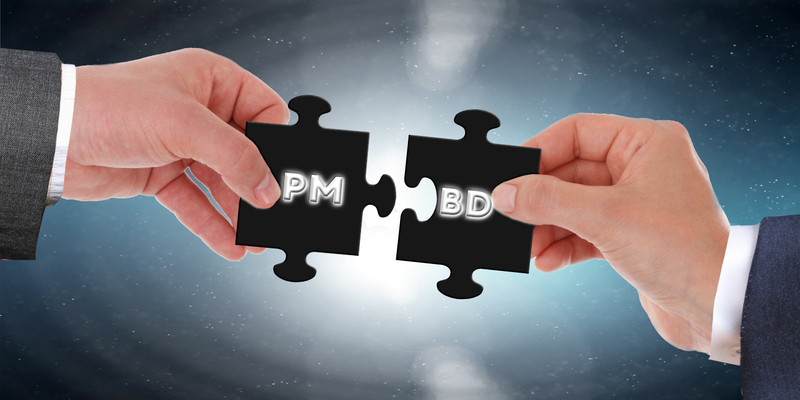 PM and BD have more in common than meets the eye. We tend to keep them siloed in the back and front ends. What do you think will happen if you brought the two together?